Our Horseshoe Nail Cross Necklaces and Anklets are $3.00 each!! You receive FREE SHIPPING if you buy 25 or more cross items. Chuck has been making these horseshoe crosses and serving others for 14 Years, since 2004 here in Kentucky. We have been honored to serve missionaries, book stores, mom and pop stores, fundraisers, non profit organizations, churches, and of course individuals who are looking for a way to share their faith. If we had kept up with all the compliments and recommendations we have received over these years, we would have several thousands of 5 Star Reviews! As you can see these are beautiful crosses made with horseshoe nails. Choose two contrasting colors and we will design your Double-Wrap nail necklace just for you. All of our different color designs. Everyone has their preference, but I just love this design. The Combo cross of nails is stunning. 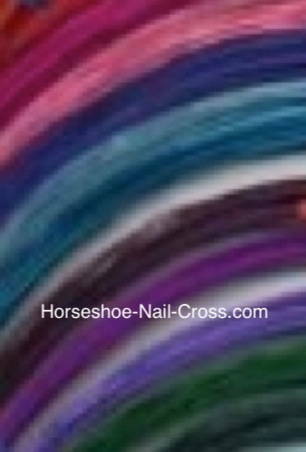 We have many color options for all of our horseshoe nail crosses. Choose two favorite colors to make your very own horseshoe nail cross Necklaces. We have up to Six color Nail Crosses to choose from. Above is the Maudi Graw cross. Think of Red, White, and Blue Patriotic crosses. Or look in our Cross Gallery for the Spanish Cross. You choose your colors and color placement. I’m sure you will find the exact Horseshoe Nail cross you need. Believe me, they are much prettier in person! I do not take very good pictures, nor do I have expensive equipment to do so, but rest assured these nail crosses are even nicer in person. Every picture you see on our site, is one actual Horseshoe Nail Cross Necklace Chuck has made. We did not go through them to pick the best picture.... these are just random crosses. I am grateful that I don't need good photo skills, because Chuck does such quality work. Those he has the honor to serve come back over and over, recommending others. We are very grateful about that. Thank you all! Our unique horseshoe cross nail necklaces can be transformed into a cross Anklet too and are a real eye catcher. Made with the smaller nails, they are sure to catch the attention at craft fairs. We have the Angel Cross necklaces, but we like the Angel Ornaments the best. This was a design Chuck came up with many years ago. This Angel Ornament is a lovely addition to your Christmas tree or you could hang it from anywhere if you turn the wire hanger. Some people love as many colors on their cross as they can get, so we came up with the Six Color Horseshoe nail crosses. It is amazing how popular these horseshoe nail crosses are. Everyone wants one! You can see several horseshoe cross necklace that Chuck came up with, like the Camo cross necklace. He keeps one of the Camo cross keychains on his four wheeler. Others have came up with cross colors that represent their school or sports team. Especially their sports teams! As you will see with all of the beautiful copper wire colors that Chuck wraps the crosses with, it will be hard to only pick only one cross. Just a heads up, the black horseshoe nail cross necklace is one of the most popular solid colors for the cross necklace. So be sure to grab a few black horseshoe crosses for your bag. Either way, your cross necklace made of horse shoe nails is a beautiful way to share your faith and it looks good at the same time. We sell our wholesale crosses for $3.00 each. Remember you receive free shipping when you order 25 or more pre made crosses. We have two sized horseshoe nails and two sized wires, which means four varieties to choose from for your cross necklace. I am sure you will be able to find just the color you are looking for your cross necklace. 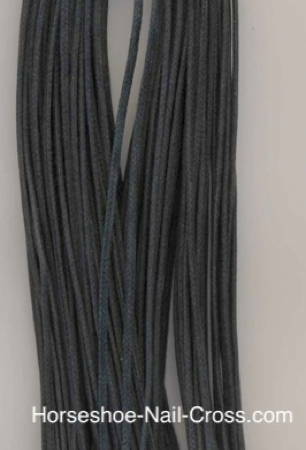 Waxed cotton necklace cord if you make your own nail crosses. Available in Black, Brown, or Tan. You can look at at several versions of cross color combinations. We offer one, two, and three colors on the same cross necklace. The price is the same on those crosses. All of those horseshoe nail crosses are $3.00 each. Then we have my favorites; the Double-wrap cross necklace, the Combo-wrapped cross necklace, and the Crazy cross necklace. These are wrapped like a barber pole. These nail crosses are $4.99 each wheather it is a necklace or a different variety. These are my favorite of all of the crosses! Second in line of popularity are the key chain horseshoe nail crosses. The horse shoe nails and color coated wire on the key chains dangling from your car's ignition or in your hand while talking to others is a wonderful ice breaker. Most all of the Necklaces are $3.00. The same free shipping applies with all of our pre made crosses. We offer these at Wholesale crosses for everyone. Are you looking for Christian fundraising ideas? 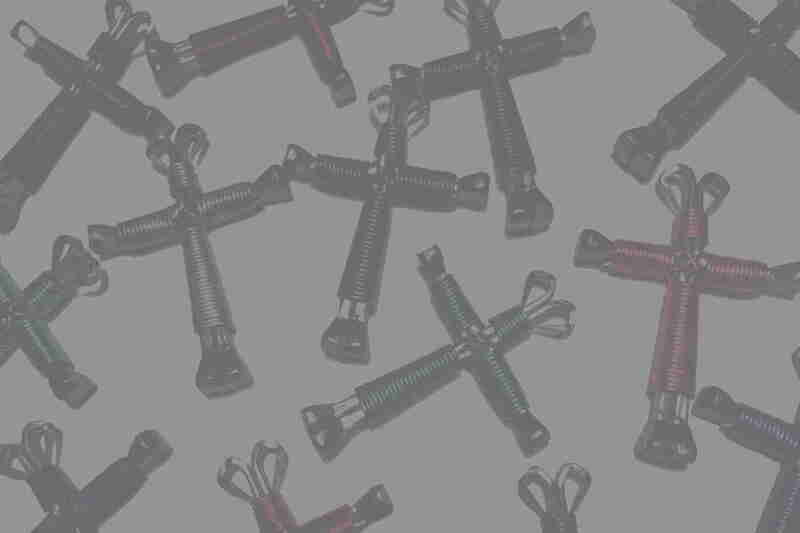 Christian fundraisers are a breeze with our Nail Crosses, because they seem to sell themselves. Our Necklaces comes in many, many styles. The quality is outstanding!! But their price is comparable to cheap cross necklaces. That is so we can help others with wholesale crosses. Chuck’s makes a Horseshoe Nail Cross Zipperpull that is just beautiful. The Rear View Mirror horseshoe Nail cross can be a great way to open discussions in your car. A wonderful way to open a conversation and share your faith. You can share the message behind the cross with wire wrapped around the nails and the cord that the nail hangs from. Or you could just wear you horseshoe cross necklace to begin conversations you never thought would come about. 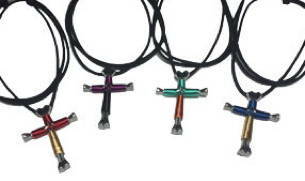 A lot of people give their cross necklace to the person they are talking to, so be sure to buy extra. All of our crosses range from $3.00 to $4.99. 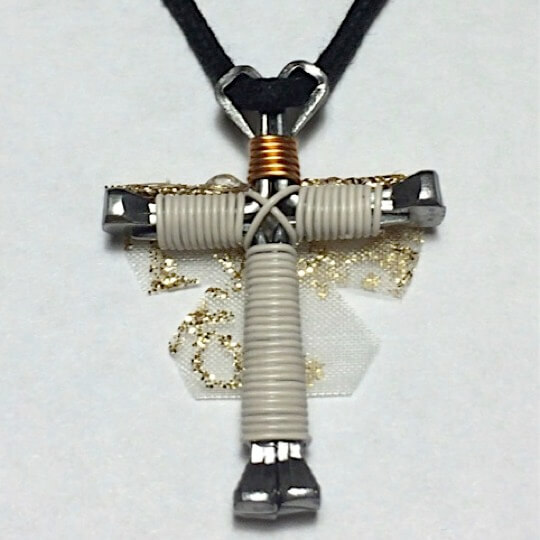 If you see a horseshoe cross nail necklace in a certain color scheme, you can rest assured that we can make the same cross with the same size horseshoe nails in the other types of crosses. We have other designs beside the unique cross Necklace. Those include the Cross Keychain, Zipper pull, Angel Cross Necklace and Angel Ornaments… and Double wrap cross of nails!! These cross of nails are made with the original 3.5 horseshoe nails is probably the most purchased cross necklace we have sold over the years with the 20 gauge color coated copper wire. But I personally, I love the #3 capewell horseshoe nails with the 22 gauge color coated copper wire. Make sure you look at that one while you are here. process of cross making. Be sure to look at our Notices Page. We try to keep it updated with our estimated current shipping date. This changes constantly because we have a lot of return customers. Some of which are book stores, non profit organizations, etc. Your order could be specially made for you the day after you order, or it could be the following week. So check first, if it matters. Or if you have an urgent order, send us email or give us a call and we will see what we can do. Your nail crosses are made the day before they are shipped. Chuck makes each cross necklace by hand. He then dips them in a special coating. Take a look at our Notices page(I try to keep updated) in order to see estimated shipping date before ordering or, give us a call and we can confirm your exact shipping date. We hope that you will take a look around. I believe you will agree that Chuck may sell these crosses cheap in order to get into more people's hands. But at the same time, he makes the best quality crosses your will find. See a very tiny sampling of what others have to say about Chuck's horseshoe nail crosses.